This software is a very much modified version of the GpsDrive software that has been optimised for displaying on a small PDA screen, in particular for an iPAQ running Linux. This software is based on the original GpsDrive program that is available from http://www.gpsdrive.de/. The starting point for these modifications is version 2.10pre2 which was released under the GPL by Fritz Ganter in 2004. The original version of GpsDrive used as the basis for this was version 2.10pre2 which has been the latest released (not CVS or SVN) version of GpsDrive for several years. This version of GpsDrive was available in Familiar version 0.8.2 but not available in Familiar version 0.8.4 (although the previous version would still install and run). The problem with this version of GpsDrive is that although it has a PDA mode the GUI doesn't work very well and the program seems very slow. Between the time that I finished making the modifications (September 2007) and the time that I decided to release them (November 2007) a new version of GpsDrive has been released (version 2.10pre4). The many changes in this new version have not been aimed at optimising the PDA mode. The modifications that I have made to the original GpsDrive are released under the GPL version 2 which is the same as the original code. There are a huge number of incompatible changes made to create this version. It would be too difficult to try and merge the changes from this version back into the main GpsDrive tree. For the same reasons it would also be too difficult to merge the latest changes in the main tree into this version. This version must be recognised as an evolutionary dead-end but one that serves its purpose better than the mainline versions. A lot has been removed that isn't necessary or sensible on the iPAQ and some changes have been made to the user interface to make things easier to see on the small screen and easier to use. Changes made to the standard gpsdrive-2.10pre2 source distribution are listed below. The screen shots below show the layout of the user interface. There are now five tabs for "Map", "Zoom", "Waypoint", "Status" and "Menu". These replace the three tabs that were present in the original version (screenshots of the standard GpsDrive are visible on the GpsDrive Screenshots page). The map tab is almost unchanged from the original. 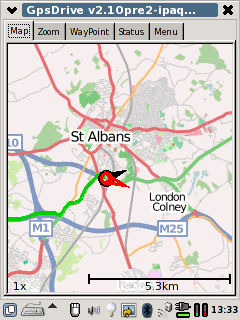 Two views are shown with maps using OpenStreetMap zoom levels 11 and 13. 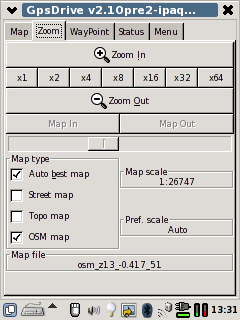 The zoom tab controls the map zoom level (x1 - x64), map preferred scale and type of map allowed. 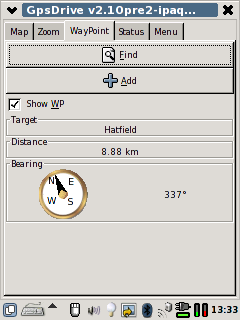 The waypoint tab allows selection of the waypoint as well as providing information about distance and bearing to it. 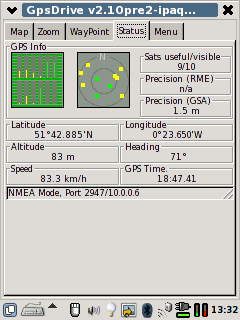 The status tab shows the GPS satellite status, position, time, speed, heading and GPS accuracy. The menu tab contains the remaining buttons from the original program. To create the map images to use with this version of GpsDrive there is a script provided that will download the images from OpenStreetMap. The zoom factor is a number from 5 to 16 where increasing zoom provides more detailed maps. I would suggest using a zoom of 11 (or 12) for driving maps and zoom of 13 for walking maps. Viewing the maps at http://www.openstreetmap.org/ should allow the appropriate zoom factor to be selected. The script can either download a single map for a specified location (provide the latitude and longitude of the location) or for an area (specify two opposite corners). In all cases it will download the appropriate tiles from OpenStreetMap (which are all 256x256 pixels) and combine them into a standard GpsDrive map (1280x1024 pixels). Tidy up documentation, copyright notices, first release version. Update status tab coordinates properly when it is selected. Update the bearing information properly. Use integers rather than double precision for screen coordinates. Added version history, fixed OSM script to append new maps to list, changed rounding rule for lat,long to x,y conversion. 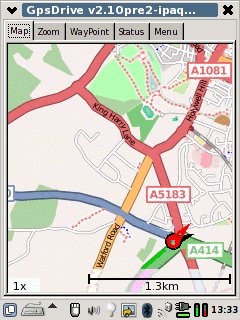 Added waypoint name, distance and bearing indicators to map display. Use simpler distance calculation function (<1% error but 3x the speed). Allow removal of waypoint. Don't display arrow, bearing or distance to waypoint if none is selected. Don't print message if NMEA checksum is wrong. Remove all map types except OSM. This will require replacing map_koord.txt with osm_koord.txt, the gpsdrive-ipaq-osm.pl script will create it. The original GpsDrive version 2.10pre2 source code (1.96 MB). 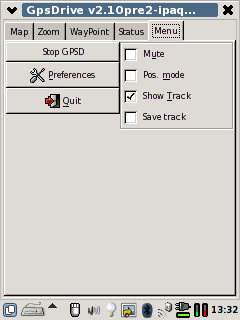 The modified GpsDrive version 2.10pre2-ipaq source code including the map creation script (129 kB). A compiled version of GpsDrive version 2.10pre2-ipaq for Familiar 0.8.4 (132 kB). The source code for the older versions listed above are in the download directory.